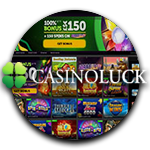 Casino Luck has been around since 1999 but has recently received a makeover, and got itself a new look, new management and even new software. You can now play the much loved Net Entertainment games at this simple and practical online casino. The logo is the lucky four leaf clover, and I can assure you that you will get lucky when playing one of the fantastic games on offer from this casino. Since only NetEnt games are offered here, there is no confusion in what games to choose and since NetEnt games are some of the best to play this a great casino choice. Casino Luck offers all its players a 100% welcome bonus, this gives you 100% match on your first deposit of up to 150 euros. So you have double the money to play with and double the chances to win when you play using the welcome bonus. There is of course some terms and conditions that you must read before choosing to accept this fantastic offer. For example you need to wager the bonus money 30 times, so that means for 150 euros bonus money you have to play the game enough times to wager the money, this is 4500 euros so you need to bet and play about with the bonus until you have played up to this. Once you have done this the bonus money becomes real money that can be withdrawn to your bank account or whatever way you prefer to transfer your funds out of the casino account. There is also a reload bonus for Casino Luck, this is a really great offer for regular casino players as you receive it every single month. This is a 50% bonus on first deposits every month of up to 150 euros, so if you deposit 300 euros as your first deposit of the month you will receive 150 euros reload bonus money giving you a total amount of 450 euros to play with. You have to wager this bonus 20 times and it has to be used within 30 days of receiving it otherwise it will fall through. Of course these bonuses both welcome and reload can’t be used on every single game, so you will need to check that out before accepting these bonuses as if your favourite game is one of the games that is restricted then it might not be worth your while. The customer care section of Casino Luck is quite straightforward although there are not as many options as some other larger casinos, for example there is no live chat for Casino Luck. You can of course drop them an email any time you like 24 hours a day 7 days a week, 365 days a year! You can send them instant messages if you are logged in and wish to get a response right away, and there is a contact number you can call should you need. Casino Luck has a long list of FAQs that will make using this website much easier as there is a lot of information to read through should you have any queries at all. The FAQs are listed into small sections that make choosing which section you need easier to navigate. There is even a whole section about the casino games so should you have any connection issues or such you will find the answer to your questions here. You can choose a deposit limit or you can choose to be excluded from one or all the games you frequently play. This will help you to keep track of the money you spend and the time you spend gambling, as this is when a fun pastime becomes a habit which can be dangerous. Casino Luck has a responsible gaming section that gives you all you need to know to assess whether you need to take action and stop gambling as much. There are even a list of questions you can ask yourself or a loved one to decide on the next step to take in breaking the addiction that can lead to losing money you can’t afford. Of course if played in moderation online gaming is one of the most enjoyable pastimes, adn playing with Casino Luck you just know you are getting a great product from people who actually care for their players well being.